We offer help and support to individuals, informal groups, churches and parishes, who wish to explore the spiritual aspects of life and faith in their own setting. If you would like to meet on a one-to-one basis to reflect on your life and prayer, we can refer you to a trained spiritual director (spiritual companion). If your work involves you in pastoral care or attending to the spiritual dimension in other people, and you feel the need for some personal support, we can put you in touch with a trained supervisor. If you wish to make the Ignatian Spiritual Exercises, this requires regular individual meetings with a spiritual director/companion. We offer occasional retreats in various locations (see Retreats page for details). Shorter retreats and quiet days can also be arranged. Some Epiphany Group members now offer spiritual direction and guidance through the Ignatian Spiritual Exercises by Skype. It’s always good to ask, if this is of interest! At its simplest we can help you plan an event which you would like to organise and run yourselves. If you prefer us to organise it, we can give Quiet Days of prayer and reflection or Retreats in Daily Life (where a spiritual guide meets the retreatant each day, over one week or, in an extended version, meets the retreatant weekly over a 5-6 week period). 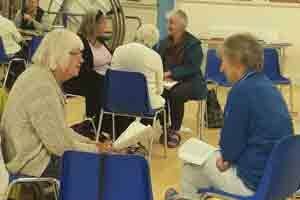 Courses on exploring prayer and reflective living, training to accompany others in their spiritual journey, and training in spiritual direction, are offered on a regular basis around the country if numbers and location make these feasible; most recently, courses have been offered in Aberdeen, Edinburgh and Galloway. For those who have made the Spiritual Exercises and trained in spiritual direction, and who would like to develop their ability to guide others, we offer occasional Training Seminars on giving the Spiritual Exercises.